Wondering what "remaining time charges" and "unused time credits" are on your Timely invoice? Let's break it down! 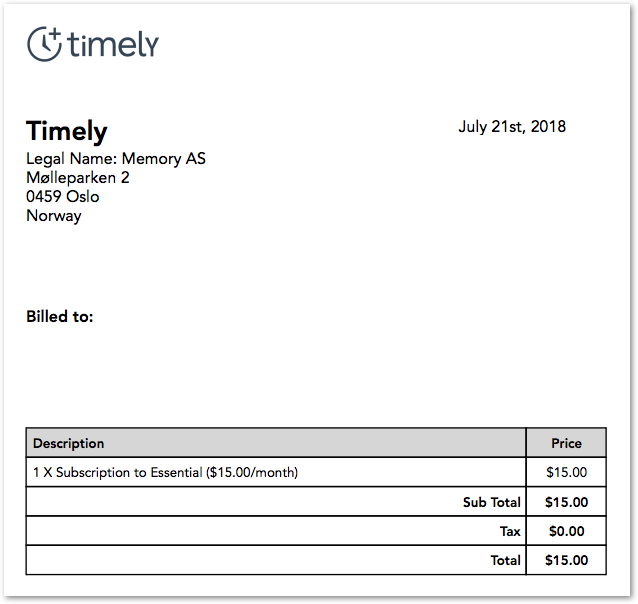 When you purchase an Essential monthly Timely subscription, you pay $15 per user in advance for the next month. On your first invoice below, you paid $15 (the price of one user, for one month). As you add new users at different times during your billing period, you are charged pro rata for any time remaining between billing cycles. This means that on the invoice, you are credited for any unused time for any existing users, and charged for remaining time left until your next billing period for all users, including the new addition. Let's take a look at actual invoices for a company over the period of one month. The billing date for this company is on the last day of the month. 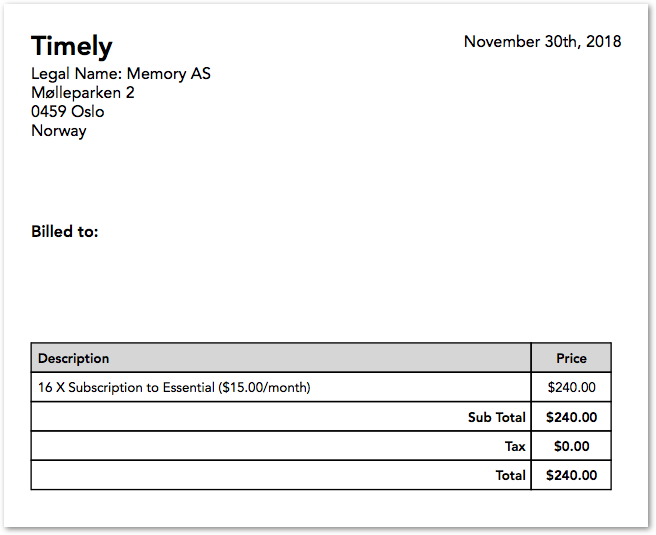 On November 30th, the company was charged a full payment of $240 for 16 active users on the monthly essential plan ($15/month/user). On December 5th, one additional user was added to the account. 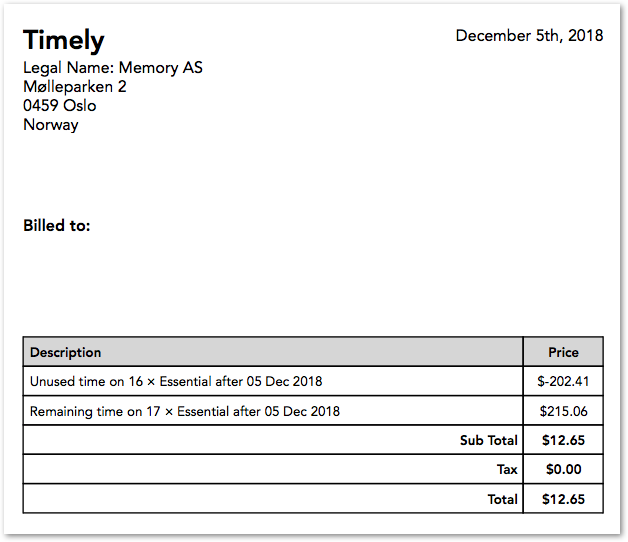 The company was credited $202.41 for unused time - or time left - for 16 active users between December 5th and the next billing cycle of December 31st. They were then instantaneously billed for time remaining for the now 17 users from December 5th until the next billing cycle of December 31st. The total charge for adding the new user is the difference between the unused time and remaining time, or a pro rata amount of $12.65 for adding a user between billing cycles. The invoice you've received simply includes the cost of the extra users, minus the time they weren't active on your Timely account. This process repeats for each additional user added to the Timely account. The upcoming payment on December 31st will be $255, or the full payment for 17 users on the Essential month plan between December 31st and January 31st. If you have questions about billing and invoices, please contact Support via your in-app chat or consult support.timelyapp.com.